Venezuela's re-elected President Nicolas Maduro gestures as he leaves after receiving a certificate confirming him as winner of Sunday's election, at the National Electoral Council (CNE) in Caracas May 22, 2018. OTTAWA — Canada and its fellow G7 countries along with the European Union issued a joint statement today saying they are united in rejecting and denouncing the recent presidential election in Venezuela. 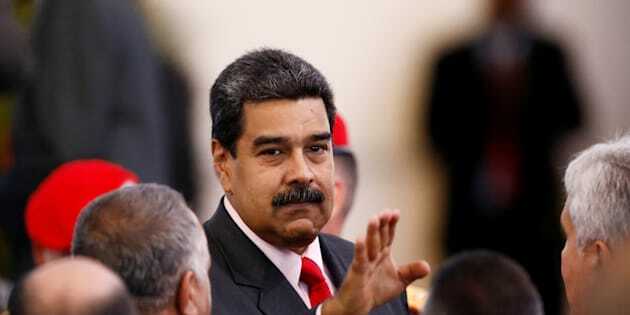 The May 20 election of Nicolas Maduro has already attracted widespread condemnation, with Foreign Affairs Minister Chrystia Freeland earlier calling the vote "illegitimate and anti-democratic." The joint statement says by "failing to meet accepted international standards and not securing the basic guarantees for an inclusive, fair and democratic process, this election and its outcome lack legitimacy and credibility." The G7 and EU add that while the Maduro regime "solidifies its authoritarian grip, the people of Venezuela continue to suffer human rights abuses and serious deprivation." The statement calls on Maduro to restore constitutional democracy in Venezuela, schedule free and fair elections, immediately release all political prisoners, restore the authority of the National Assembly, and provide for full, safe and unhindered access by humanitarian actors. On Monday, the Canadian government applied some pressure on its own by saying it would not seek to replace its ambassador in Caracas and would "downgrade" its diplomatic ties with the South American country. Ottawa also imposed a ban on formal military co-operation with Venezuela and ensured the Canadian embassy in Caracas is only headed by a charge d'affaires rather than an ambassador.